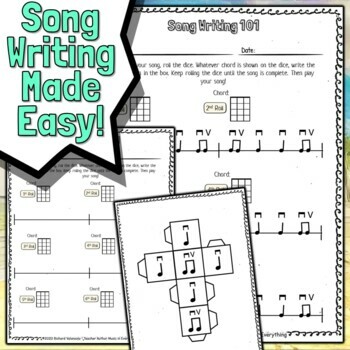 This is a wonderful resource to teach your students how simple song writing can be! When knowing the secret formula of what chords are used in a certain key signature, students will learn that the possibilities are endless, and there are no wrong answers! The dice included is simply cut around the edges, and glued to become a dice. 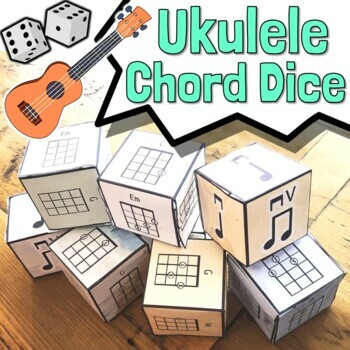 On the face side of each dice are the most commonly used chords in the key of C: C Major, D Minor, E Minor, F Major, G Major, & A Minor. Unfortunately there is not a 7th side to but B Diminished! Sorry Diminished Fans! 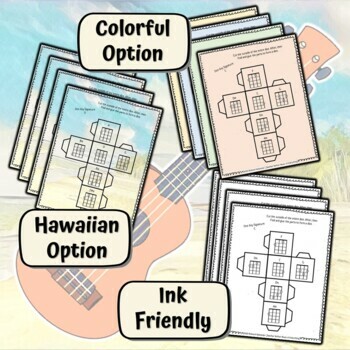 The second page is where students will write their song. Directions explain to students that they simply roll the dice, and then jot down box by box which chord the dice reads. When students finish filling out all 16 Boxes, they can play their song or it can be demonstrated by you! 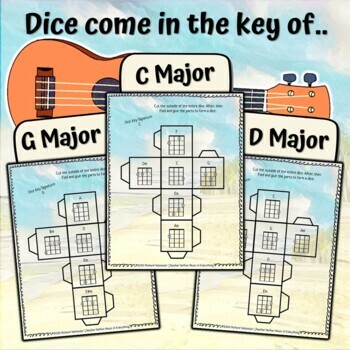 Students will hear how even by chance of the dice these chords sound great! The page requires students two write the name of the chord, and draw circles where the fingerings go for that chord.